Yellow Pages upped their stake in 1973 with a six-race "International" championship, in addition to which BP sponsored an 18-race national championship. Colin Vandervell and John Nicholson contested the two series, with Vandervell taking the more lucrative Yellow Pages title and the Kiwi winning the BP title. 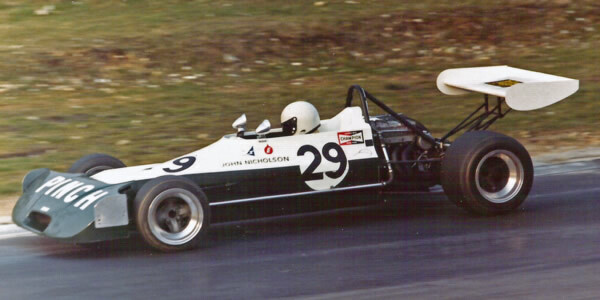 Nicholson won more races than anyone else (seven) in his Lyncars but the March 73Bs of Vanderwell, Friswell and Choularton bettered that between them winning eight races; the March 722 of David Purley won another five. Tom Pryce won three consecutive rounds early in the season in the Royale RP12A but took the chance of a promotion to the Rondel F2 team and was in F1 by the following season. Purley remained in contention until near the end of the BP series but retired from the last two races allowing Nicholson and Vanderwell to pull away. Cyd Williams, runner up in 1971 and 1972 was quick, but his Brabham BT40 turned out to be a bad choice and had only a couple of pole positions to show for a frustrating season. This six-race series used a 20-15-12 system with the last round counting double. Vandervell had a win, three seconds (one at the last round) and a third. Nicholson had two wins, a third, a fourth (at the last round) and two fifths. Purley had two wins and a third. Friswell won the last round but his only other race netted third. Points table from the John Player Motorsport Yearbook 1973 p281. This series ran over 18 races using a 9-6-4 points system but there may also have been points for fastest lap and possibly double points at the last race. Points table from the John Player Motorsport Yearbook 1973 p281. The other races were won by Ray Mallock (March 712M/73B), Stephen Choularton (March 73B) and Peter Wardle (Surtees TS15A). Two non-championship races are also included above and were won by John Lepp in the Central Garage (Mirfield) Ltd Chevron B25 and by Mallock. The results here have been compiled by Chris Townsend using Autosport and Motoring News. Not all the results are entirely complete: results sheets or details of non-starters are needed for Brands Hatch 18 Mar 1973, Mallory Park 1 Apr 1973, Snetterton 20 Apr 1973, Brands Hatch 23 Apr 1973, Mallory Park 24 Jun 1973, Croft 1 Jul 1973, Silverstone 14 Jul 1973, Mallory Park 22 Jul 1973, Silverstone 28 Jul 1973, Brands Hatch 12 Aug 1973, Snetterton 27 Aug 1973, Oulton Park 09 Sep 1973, Oulton Park 22 Sep 1973 and Snetterton 28 Oct 1973. The only entry list still needed is for the non-championship race at Thruxton 29 May 1973. Grid sheets or details of qualifying are needed for most races: Brands Hatch 18 Mar 1973, Mallory Park 1 Apr 1973, Snetterton 20 Apr 1973, Brands Hatch 23 Apr 1973, Silverstone 20 May 1973, Brands Hatch 27 May 1973, Thruxton 29 May 1973, Mallory Park 24 Jun 1973, Croft 1 Jul 1973, Oulton Park 7 Jul 1973, Mallory Park 22 Jul 1973, Silverstone 28 Jul 1973, Brands Hatch 12 Aug 1973, Mallory Park 26 Aug 1973, Snetterton 27 Aug 1973, Oulton Park 22 Sep 1973, Brands Hatch 30 Sep 1973, Brands Hatch 12 Oct 1973 and Snetterton 28 Oct 1973. Chassis identification is largely from chassis plate observations by Adam Ferrington and others, details of previous owners of second-hand cars (typically F2 cars which have been identified from F2 reports) plus Royale production records. A March 73B production list undoubtedly exists somewhere and a copy would be most welcome, as would Rondel production records. More details of the Martin, Kitchiner, Huron, Hawke and Wimhurst would also be very helpful.